A recent paper published in Innovations in Clinical Neuroscience examined the issues surrounding the growing use of data quality monitoring in CNS clinical trials. Drs. David Daniel and Gary Sachs from Bracket contributed to this broad examination of the challenges and benefits of implementing this monitoring. The paper summarizes the results of the CNS Summit Data Quality Monitoring Workgroup analysis of current data quality monitoring techniques used in central nervous system (CNS) clinical trials. Based on audience polls conducted at the CNS Summit 2014, the panel determined that current techniques used to monitor data and quality in clinical trials are broad, uncontrolled, and lack independent verification. The majority of those polled endorse the value of monitoring data. In a pre-competitive session among pharmaceutical companies, clinical service companies, and clinical trial sites, there was an overall strong consensus that data quality monitoring and remediation has large positive effects on signal detection in CNS trials. The authors also examined how this data quality monitoring will evolve in the future. Increased utilization of biomarkers and genotypic and phenotypic patient characterizations will increasingly be used as patient selection and outcomes measures, but will require careful validation against current measures. Although, there were a number of suggested new approaches, the creation of data banks of rater experience, credentials, and performance was agreed upon as high priority achievable pre-competitive objectives. Bracket has been a leader in this area, both through our own extensive proprietary database of investigator and rater experience in clinical trials, but through our support of the CNS Summit Global Rater Certificate Database. Read the CNS Summit Data Quality Monitoring article here. 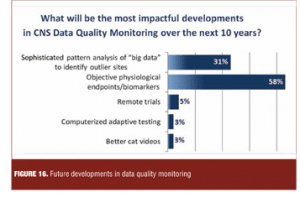 FULL CITATION: Data Quality Monitoring in Clinical Trials: Has It Been Worth It? An Evaluation and Prediction of the Future by All Stakeholders. Clinical Neuroscience. 2016 Feb 1.